HKIHSS | Is the Concept of Secularism Relevant to China? Is the Concept of Secularism Relevant to China? Asia/Hong_KongIs the Concept of Secularism Relevant to China? The lecture draws up the principal ideas from a chapter in Professor Duara’s forthcoming book concerning the historical field of Chinese religions in comparative context in order to identify its distinctive problems and possible pathways. In order to distinguish religions in the Sinosphere from other statereligion relationships in the longue durée, we need to identify how the state and religions have managed the question of transcendence. The speaker explores the relationship between state and religions in late imperial China, focusing especially on the Qing period and redemptive societies. What were the methods whereby segments and groups in popular religion accommodated diversity? What were the techniques of self-formation linking the self/body to the local and to universal ideals in late imperial China? Professor Duara argues that the Chinese case has largely escaped the conflicts among confessional communities through much of its history. It also largely escaped the late 19th and early 20th century penetration of faith-based models of nationalism that appeared in Japan and India. But if the Chinese case escaped both these developments, it suppressed and continues to deal with another type of problem: a vertical division — between state and elites versus popular religiosities — rather than a lateral competition in the realm of transcendence and faith in the modern transition. In significant part because our notions of religion in Asia derive from the radical categories of the Abrahamic faiths, we see why the idea of secularization seems to do so little for our understanding of modern China even though the question of religion is an explosive one. 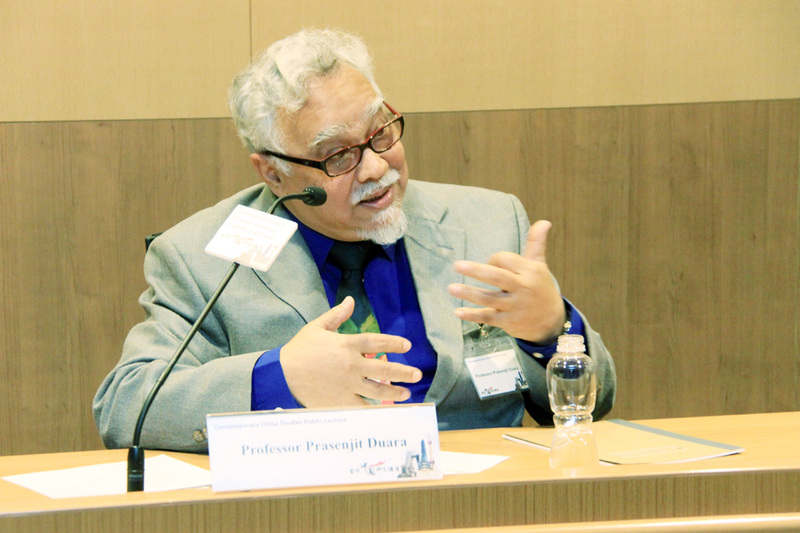 Prasenjit Duara is the Raffles Professor of Humanities and director of the Asia Research Institute at National University of Singapore. He was born and educated in India; received his PhD in Chinese history from Harvard University; and was previously professor and chair of the Department of History and Chair of the Committee on Chinese Studies at the University of Chicago. In 1988, he published Culture, Power and the State: Rural North China, 1900 – 1942, which won the Fairbank Prize of the AHA and the Levenson Prize of the AAS, USA. Among his other books are Rescuing History from the Nation (1995), Sovereignty and Authenticity: Manchukuo and the East Asian Modern (2003), an edited volume, Decolonization: Now and Then (2004), and A Companion to Global Historical Thought coedited with Viren Murthy and Andrew Sartori (2014). His work has been widely translated into Chinese, Japanese, Korean, and the European languages. His new book, The Crisis of Global Modernity: Asian Traditions and a Sustainable Future, will be published by Cambridge University Press later this year.